Saint Tirugnanasambandar had praised the glory of the Lord in his Thevaram hymns. Lord in the Tirundudevan Kudi temple should be approached by those in need of medicines, mantras and teachings for a righteous life, says the saint in his hymn. 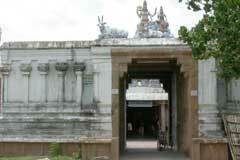 This is the 42nd Shiva temple on the northern bank of Cauvery praised in scriptures. Maha Shivrathri in February-March and Tirukarthikai in November-December are the festivals celebrated in the temple. Tirundhudevan Kudi Lord is a Swayambumurthy. 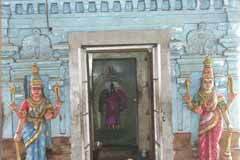 There are two Ambicas in this temple against the traditional one in Shiva temples. The hole through which the Cancer (Nandu in Tamil) entered the body the Lord and scar caused by Indira are visible on the body of the Linga. The temple is open from 9.00 a.m. to 1.30 p.m. and from 4.00 p.m. to 7.00 p.m.
S. Ramanatha Sivachariar, 20/27, South Street, Veppathur Post – 612 105, Tiruvidaimaruthur Taluk, Tanjore dist. Sri Vinayaka of the temple is worshipped as Karkadaka Vinayaka. 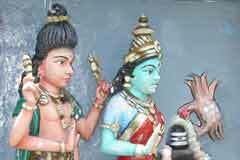 Lord Muruga with His consorts Valli and Deivanai graces from a shrine in the prakara. Lord Nataraja appears in a Sudha Sculpture. There is no shrine for the Navagrahas the nine planets. As Indira realized his mistake and corrected (Thirundhuthal in Tamil), the place is named Tirundhudevan Kudi, the name is not familiar with the people of the locality. They know the place as Nandu Koil only. Devotees perform gingely oil abishek to Lord Karkadeswarar for relief from adverse planetary aspects. They also consume this oil as a medicine for diseases if they have. People perform special pujas to Lord and Mother and offer vastras. A swayambulinga existing in this place then g0t buried under the sand here. A chola king was ruling this place then. He had an attack of paralysis and no doctor was able to cure him. He fell at the feet of Lord Shiva finally. An aged couple came to his court, gave him the water dissolved with sacred ashes. The king got up completely cured and requested them to stay in the place as royal doctors which they declined. He offered them gifts of gold which too they denied to accept. When the king asked them what exactly they wished, brought him to this place and asked him to build a temple where the Shivalinga was then and simply disappeared then. The king understood that the visitors were but Lord Shiva and Mother Parvathi and built the temple. People pray to Lord here for relief from disease-Pini in Tamil. Saint Gnanasambandar has mentioned Lord in his hymn as Pini Neekkum Shiva. 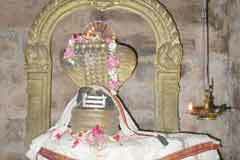 Generally, we find only one Ambica shrine in Shiva temples. There are two Ambica shrines side by side. During the construction of the temple, Ambica in the place was lost. 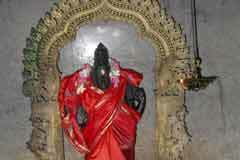 Hence, a new Ambica idol was made and installed and named Arumarundhu Nayaki meaning that She came as a medico. 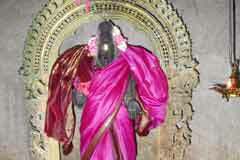 Within a few days, the original Ambica idol also was found and installed with the name Apoorva Nayaki. She is the main Ambica of the temple. 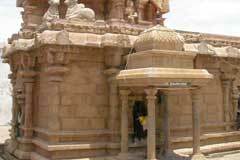 This is the temple to seek relief from the Karkadaka-Cancer in English and Nandu in Tamil-zodiac sign comprising of three stars-Punarvasu, Poosa and Ayilya. The hole on the body of the Linga created by the Nandu and the scar caused by Indira is still visible. There is a shrine for Moon-Chandra at the entrance of the temple. Those having problems due to Moon aspects pray in this shrine. Sage Durvasa was engaged in his Shiva Puja when a Gandharva (a community in the celestial world) mocked at his old age appearance. The sage did not mind it. Yet, the Gandharva continued the mischief and even called him by clapping hand moved before him as a cancer-Nandu. Angry sage cursed him born a Nandu. Realizing his folly, he sought the pardon of the sage. 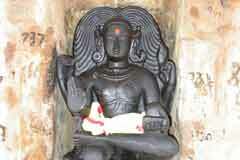 He was advised to perform Shiva Puja to gain his original form. He came to this place as a Nandu, bathed in the pushkarini, picked up flowers and worshipped the Lord. Meantime, Indira the king of Devas also came to this place to perform Shiva Puja as advised by his Guru to acquire a power to conquer the demons. He used to bathe in the pushkarini and did Shiva Puja with 1008 flowers. Every day he found one flower falling short. He saw the Nandu doing puja with one flower. He thought that he was the only one worthy of doing Shiva puja and a Nandu was notqualified for the puja and tried to kill it with is sword. Lord made a hole in His Lina body to help the creature to escape Indira’s attack. Yet, the Linga was injured by the sword cut. Lord appeared before Indira and said that one cannot succeed by arrogance but by humility alone. As Lord granted salvation to Karkadaga-Nandu, He is praised as Karkadakeswarar. Miracle Based: Lord Shiva in the temple is a Swayambumurthy. 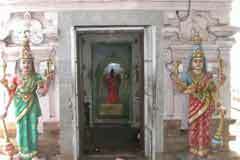 There are two Ambica shrines in the temple. The hole through which the Nandu entered in the Linga and the scarcaused by Indira are still visible on the Linga. 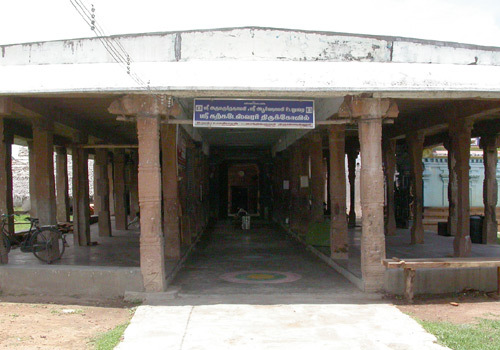 Tirundhudevan kudi is 11 km far from Kumbakonam on the Suriyanar Koil route. The visitor has to reach Tiruvisainallur from Kumbakonam. The temple is 2 km from here. Autos are available. Charge is Rs. 40/= to and fro.